L.T. 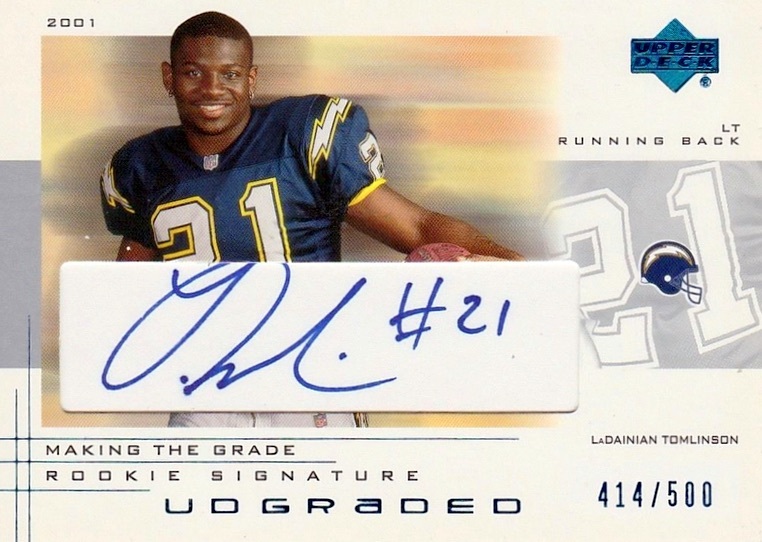 was the greatest running back of his generation, making LaDainian Tomlinson rookie cards some of the most popular NFL options from the 2000s. 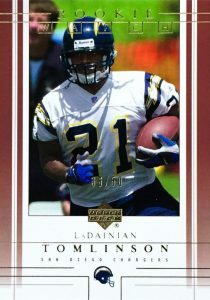 Led by 2001 Contenders, Tomlinson's rookies brought a lot of new fans into football card collecting. The list below features the key LaDainian Tomlinson cards from his first season. Before dominating the NFL, Tomlinson earned his reputation as the best running back in college while at TCU. Drafted by the San Diego Chargers with the fifth overall pick in 2001, he quickly wowed the league with his amazing offensive production. Tomlinson became the fastest player to reach 100 career touchdowns and the first player with more than 1,000 yards rushing and 100 receptions in the same season. In particular, his 2006 season was among the greatest for any running back in NFL history with 31 total touchdowns and more than 1,800 rushing yards. This success earned him the Most Valuable Player and Offensive Player of the Year Awards that year, solidifying his enshrinement in the Football Hall of Fame. 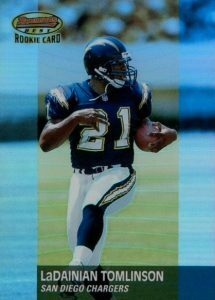 Shop for LaDainian Tomlinson rookie cards on eBay. 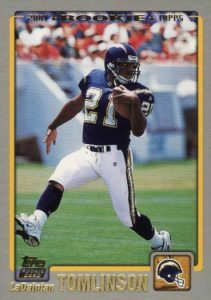 In addition to the popular 2001 cards below, Tomlinson has been paired with many other great running backs over the years to create some very memorable cards. In 2013 Upper Deck Exquisite, Tomlinson and Barry Sanders share a card that features both players in their college uniforms. Another L.T. autograph in his TCU uniform can be found in 2014 Upper Deck Exquisite Collection with USC running back Marcus Allen. More choices include 2008 Topps Triple Threads, where Tomlinson and Adrian Peterson are featured on a combo card honoring them as the leading rushers in 2007. An autograph from Tomlinson's brief time with the New York Jets can be found in 2010 Topps where he is paired with Dallas Cowboys legend Emmitt Smith. Finally, 2013 Topps Supreme sees L.T. share a signed card with his teammate Antonio Gates, while 2016 Panini Absolute pairs Tomlinson and his longtime Chargers quarterback, Philip Rivers. 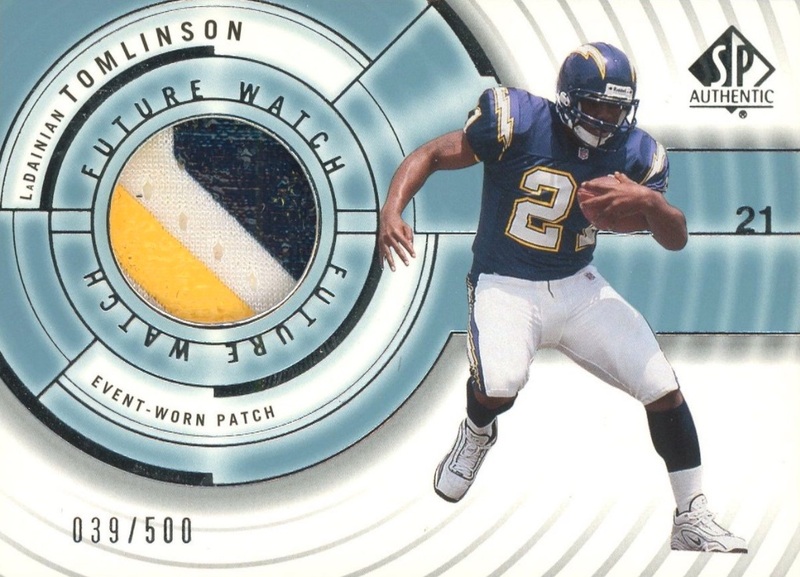 As Tomlinson was such a hot prospect entering his rookie year, he was included in just about every football set produced in 2001. 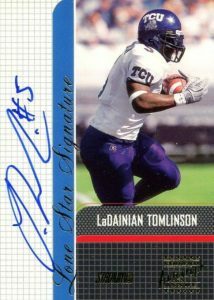 In determining the best LaDainian Tomlinson rookie cards, value is the main component, along with design and each card's availability to the collector. Notable rookie-year base cards, parallels and inserts are all highlighted below. 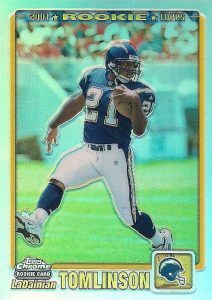 We begin the list of the top LaDainian Tomlinson rookie cards with his debut offering in the 2001 Topps flagship set. For many star players in the 1970s and 1980s, their only appearance each year on a football card was in the main Topps football set. Of course, their total career card appearances were far less than the amount that Tomlinson appeared on in just 2001. The limited-run 2001 Topps Chrome versions will be discussed further down the list but 2001 Topps is an ideal place to start your L.T. collection. 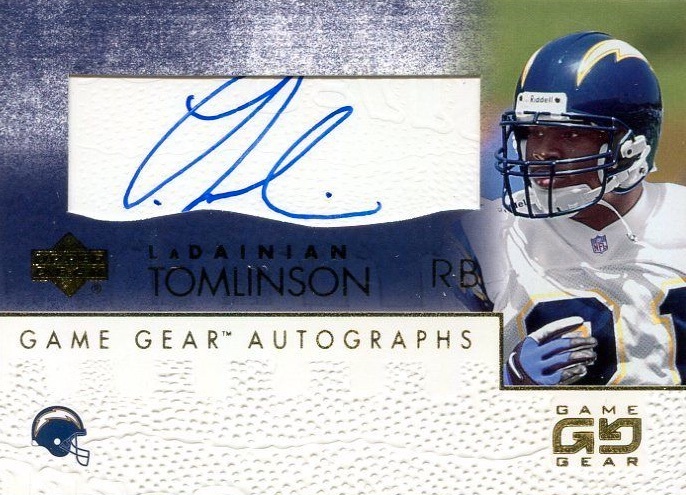 A budget-friendly autograph in 2001 Upper Deck Game Gear, the design features L.T. 's signature on a cut piece of paper rather than a sticker. As a result, his abbreviated autograph can spill over the allotted space, functionally cutting off a portion. Nevertheless, the signed rookie-year card is popular. 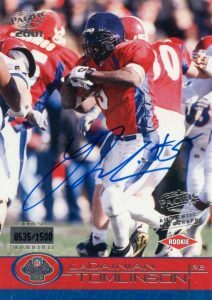 Tomlinson is featured in the middle of a run during the '00 Senior Bowl on his 2001 Pacific autograph. Wearing a red jersey and the purple helmet for the TCU Horned Frogs, Tomlinson is in the thick of the action as his offensive line blocks all around him. The big draw for collectors is the massive on-card signature. As inspiration for 2001 Topps Heritage, Topps looked back to 1956 Topps which was their first set featuring NFL players after issuing a college set in 1955. Like the original '56 design, Tomlinson is shown against a solid-color background. 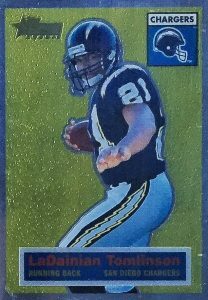 His name, team, and position are near the bottom of the card and the Chargers helmet is shown at the top. The base rookie is numbered to 1,956 copies while the rare Retrofractor parallel is limited to just 556 copies. 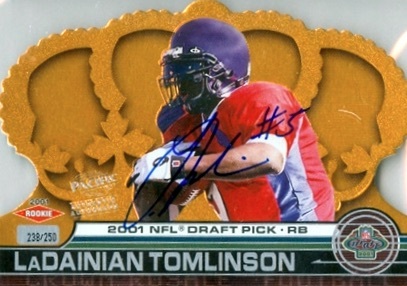 Crown Royale offers some of the most unique football cards available and the 2001 set features Tomlinson again in his Senior Bowl uniform. A jumbo version is not signed but still limited to 499 copies. After L.T. dominated college football during his senior year, the San Diego Chargers traded their first-overall pick to the Atlanta Falcons. While the Falcons took Michael Vick, the Chargers selected L.T. with the Falcons old spot (#5). Due to the trade, fans would often compare the two players' professional careers, with the Chargers certainly getting the better side of the deal in the long run. 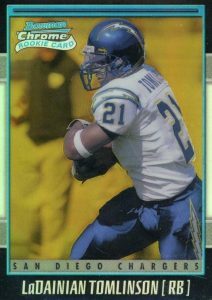 Our last college-themed card of Tomlinson comes from 2001 Topps Stadium Club and features a vertical signature. While the other two college autographs on the list showcase L.T. playing in the Senior Bowl, his Stadium Club autograph displays the full TCU uniform. As such, it should be one of the go-to L.T. cards for fans of the Horned Frogs. 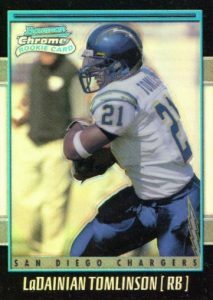 My personal favorite of the base Tomlinson rookies comes from 2001 Upper Deck. The maroon columns on the sides add a regal nature to the design and the photo that features Tomlinson's face in the shadows of his helmet is beautiful. While his standard rookie card from the set is popular, the gold version that is limited to 50 copies is, of course, valued significantly higher. One of the more readily available, rookie-year Tomlinson autographs can be found in 2001 UD Graded. In addition, there are a pair of base cards and a jersey relic version. Like the autograph, all three of the main cards are numbered to 500. To casual collectors, Tomlinson's autograph might be hard to identify without knowing you are looking at an L.T. signature. The only letter you can typically decipher is the flamboyant "L" that starts things off. On his NFL cards, Tomlinson typically adds #21, for his jersey number, at the end of the signature, while his college cards have #5. Tomlinson was regularly compared to Walter Payton throughout his career and 2001 Bowman's Best gives us a look at the leg-kicking style that Payton made famous. Both running backs also had surprising success at throwing for touchdowns. L.T. 's total of seven career TD passes is second only to Payton's eight touchdowns among modern running backs. Tomlinson was even given the 2006 Walter Payton Man of the Year Award for his community service. 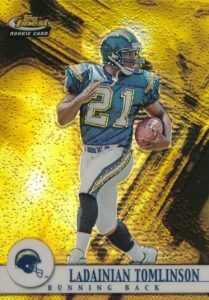 The gold background of Tomlinson's 2001 Topps Finest rookie, limited to 1,000 copies, works perfectly with the lightning bolts of his Chargers uniform. 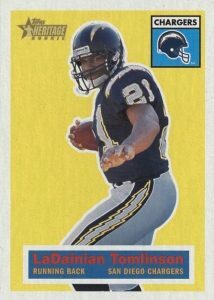 Tomlinson would spend nine seasons with the Chargers (and two more with the New York Jets) before retiring as one of just two players in NFL history to record more than 13,000 rushing yards and 4,000 receiving yards. It should come as no surprise that the other player to accomplish this feat is Walter Payton. For fans looking to scratch that itch at owning a top Tomlinson card, but don't have the scratch to afford Tomlinson's main rookie autographs, take a look at 2001 SP Authentic. These relic cards offer the opportunity to get an event-worn patch piece with a moderate print run. 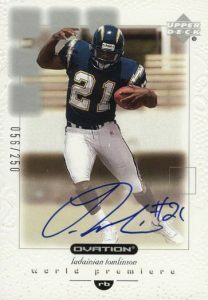 Tomlinson's World Premiere autograph in 2001 UD Ovation is easily one of his most beautifully composed signature cards. Tomlinson would again add his jersey number to the end of his autographs on the 250 cards in the set. There is also an unsigned base version with two parallels, each numbered to 250. Cards #2 and #3 on this list have similar availability as they are both limited Refractor parallels from Topps' popular chromium products. The Black Refractor from 2001 Topps Chrome is numbered to 100 copies and the base Refractor has 999 copies. Tomlinson is shown scampering toward the end zone while turning his head to look back at the defenders who failed to stop him. While the #1 card on this list is the iconic Tomlinson rookie autograph, the 2001 Bowman Chrome Gold Refractor is arguably the king of his unsigned rookie cards. Limited to just 99 copies, it is certainly a difficult pull from packs but collectors on a budget can zero in on the basic Refractor version, limited to 1,999 copies. While not numbered, the Xfractor version seems to sit between the base Refractor and Gold Refractor as far as availability. 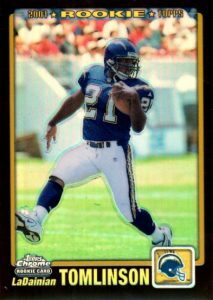 Easily the most famous LaDainian Tomlinson rookie card is this appearance in 2001 Playoff Contenders. Evoking the feel of a game ticket, the valuable card is part of the Rookie Ticket subset. While some collectors bristle at the idea of sticker autographs, the shiny nature of the foil sticker and how it is worked into the design, along with the embossed authentication over the top, seems to actually improve the overall look. Perfect mint copies of this card also fetch the highest overall prices for Tomlinson, with PSA 10 prices eclipsing $1,800. 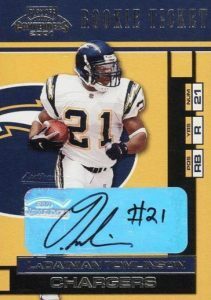 2001 Pacific LaDanian Tomlinson Rookie on card Autograph #1288 1500!